Please join us in giving a warm Anime Central welcome to Gacharic Spin as a 2017 Guest of Honor! The most powerful and entertaining all-girls band, consisting of 4 musicians and 2 dancers, celebrating their 8th anniversary in 2017. Anyone seeing Gacharic Spin’s show would be amazed by the visually-strong energy-filled live performances and excellent musicianship, accompanied by non-stop high-speed dancing. While performing over 100 shows annually, the guitarist, the bassist and the drummer have all released tutorial DVDs confirming their skills as true musicians with excerpts from bassist F Chopper Koga’s instructional video reaching over 3 million views on YouTube. Having been eager to stretch their horizons outside of Japan since the very beginning, the group has toured in the US, France, South Korea, China, Hong Kong, Taiwan, as well as playing important festivals in Japan such as Summer Sonic 2014 and Countdown Japan 14/15. Their performance at the 2014 Japan Expo in Paris was extremely well received which was followed by a successful appearance at the J-Pop Summit in San Francisco in 2015. It was on the strength of their engaging live performance that won Gacharic Spin their record contract with Victor Entertainment in 2014. Having recorded a wealth of material before then, the first album released by the new label was a “best of” album featuring all their hits. After two new singles including “Don’t Let Me Down”, a song featured over the end credits of the popular animation series Dragon Ball Kai, the group released their long-awaited new album Music Battler in September, 2015 followed by a sold out tour of Japan as well as dates in South Korea and Taiwan. In June of 2016, having landed a major synch deal with a Japanese energy drink, “Shaki Shaki Shite” was released as the newest single. The product’s TV commercial featured not only this track but also all members of Gacharic Spin giving them a big opportunity to be recognized as an accessible pop group. 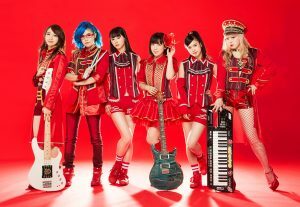 September 2016 saw the release of the group’s latest efforts in the form of a 13-track full album Kakuhen which reached an impressive #13 spot on the official Oricon chart. Commemorating the 7th anniversary of their musical career, Gacharic Spin then embarked on an extended tour of Japan closing with the final show at the Tokyo Dome City Hall in November. The high-energy performance was duly captured on video and was released in February, 2017, debuting at #2 on the weekly DVD sales chart of Oricon. Gacharic Spin will be recording new material in 2017 as well as the four musicians of the group participating in a side project Doll$Boxx with singer Fuki.